A good friend of mine was sweet enough to let me borrow her Simple Friendship set. 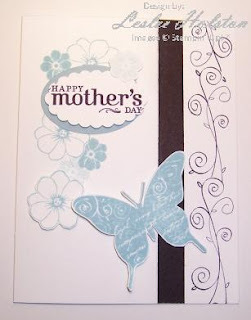 I really wanted to use the large butterfly on this card. This is a lovely set to use and there are numerous ways to use it. 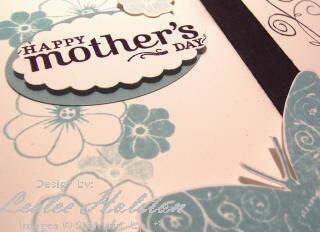 I featured this card at my Mother's Day Stamp-A-Stack yesterday. The layout was from an early morning, blurred vision that had popped into my head. Once I got to actually putting the card together (I had to have my coffee first and get the boys off to school), the colors I had pictured didn't work at all. So, I pulled out the tried and true Baja Breeze and Basic Black. This is a color combo that works every time! 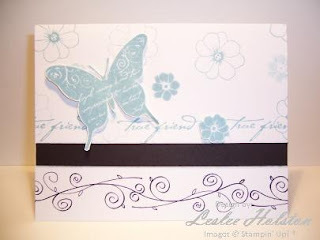 The flowers are stamped and masked directly onto the Whisper White card base with only a couple flowers cut and popped up on dimensionals for visual interest. The butterfly is on dimensionals too. Before I handed the set back to its rightful owner, I had to create a second card☺. The layout is the same as the first only I turned it 90°. I left off the Mother's Day sentiment and added the line of 'true friend' above the black strip. Thanks for stopping in today! I hope you've been inspired to give the blurred visions you have in your head a try! You might just like how they turn out!